The 2009 RECS collected home energy characteristics data from over 12,000 U.S. households. This report highlights findings from the survey, with details presented in the Household Energy Characteristics tables. How we use energy in our homes has changed substantially over the past three decades. Over this period U.S. homes on average have become larger, have fewer occupants, and are more energy-efficient. In 2005, energy use per household was 95 million British thermal units (Btu) of energy compared with 138 million Btu per household in 1978, a drop of 31 percent. Over 50 million U.S. homes have three or more televisions. Appliances, heating, and cooling equipment now use less energy to provide their services. In addition, less heat passes through the walls, roofs, and windows of homes because of better insulation and construction. At the same time, many homes contain more energy-consuming devices. In particular, the type and number of home electronics has increased significantly. The RECS Household Survey assesses the physical characteristics, fuel usage patterns, behavior, and energy-using equipment in housing units. A sample of households is surveyed and statistically represents the 113.6 million U.S. homes occupied as a primary residence. What does the 2009 RECS data say about energy efficiency? 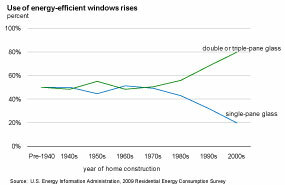 In 2009, 58 percent of housing units had energy efficient, multi-pane windows, up from 36 percent in the 1993 survey. Multi-pane windows are much more prevalent in newer homes. 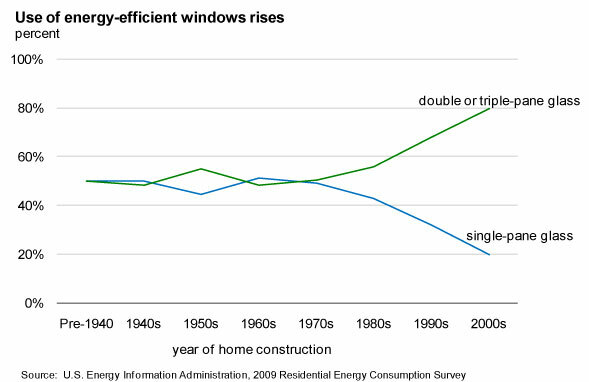 About 80% of houses built post-2000 have double or triple-pane energy-efficient windows, up from only 52% of homes constructed before 1990. Current occupants in RECS sampled homes were asked about energy-efficient improvements they had made. Over 40 million householders (35 percent) used caulking or weather-stripping to seal cracks and air leakages around their house, 26 million (23 percent) added insulation and 68 million (60 percent) have at least some energy-efficient compact fluorescent (CFL) or light-emitting diode (LED) lights. The 2009 RECS also shows that more than 44 million households (39 percent) now have an Energy Star refrigerator and 41 million households (36 percent) have purchased an Energy Star clothes washer. Energy Star and other federal programs have been enacted with the goal to further improve the efficiency of household equipment and appliances, from furnaces to refrigerators. 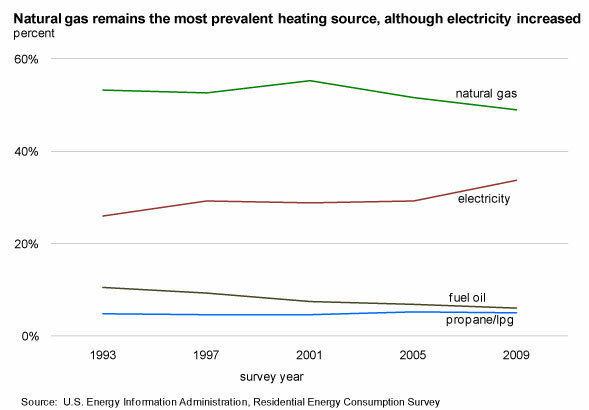 Natural gas remains the most prevalent fuel for heating homes in the United States. Over 55 million homes (49 percent) used natural gas as the main fuel source for space heating. Electricity as the main heating fuel increased from 29 percent of homes in 2005 to 34 percent in 2009 while the use of fuel oil as the main heating source continued to decline. 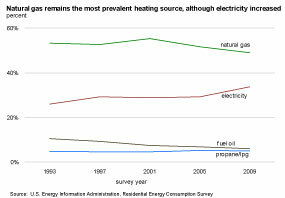 In 1993, more than 10 percent of homes were heated with fuel oil, but by 2009 this had declined to about six percent. For more statistics on fuel usage patterns see the Fuels Used and End-Uses data tables. Nearly every home in the United States has a television, and the number and size of televisions and the devices attached to them have been increasing rapidly. In 2009, over 45 million households (40 percent) had a digital video recorder (DVR) attached to the most-used television. DVRs had not been widely adopted at the time of the last RECS survey in 2005 and were not included in that survey. The increased popularity of DVRs is significant because they are replacing or supplementing VCRs and DVD players, which consume less energy per unit than DVRs. Personal computing products also showed an increase in use from the 2005 RECS. Over three-fourths of households now have a computer and 39 million homes (35 percent) have at least two computers. Detailed electronics statistics, including a new series on small, rechargeable devices, are available in the Televisions and Computers and Other Electronics tables and a special report on home electronics.